Festival Fortnight '19 Small Grants Launched | LEAP Sports Scotland Festival Fortnight small grants applications are live! "> Festival Fortnight small grants applications are live! Festival Fortnight small grants applications are live! LEAP Sports Scotland's Festival Fortnight is back with our new dates, 17th - 30th June. 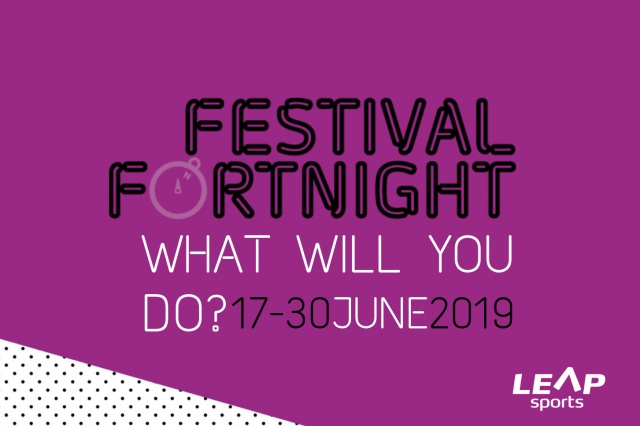 LEAP wants Festival Fortnight to offer something for everyone, whether it's in the form of sporting, recreational, academic, social or cultural events. The festival aims to increase the visibility and participation of lesbian, gay, bisexual, transgender and intersex (LGBTI) people in Scottish sport and explore LGBTI and wider equality and human rights issues in sport. In order to meet these aims and encourage a diverse and exciting programme, we are offering small grants to youth, community and sports (including physical activity) groups across the country. Grants are bigger and better than ever before. This year we are also offering up to £500 for sports and community groups running a LEAP National LGBTI open-tournament, with the premise that this will become an annual Festival Fortnight event. Festival Fortnight is open to anyone who wants to run an event during the two week period. Running an event for Festival Fortnight can help you in a multitude of ways. Every group or organisation is different, but you might find FF aids you in attracting more LGBTI members, helps you show solidarity with the LGBTI sporting community, increases your awareness of the issues at play, or facilitates celebration of LGBTI participation and identity. Interested in putting on an event, but not sure what? A community or sports group who needs a monetary hand? A youth group who could do with a little cash? Or do you already have a plan and don't need funding? You can find more information on Festival Fortnight in our Partner Handbook. Don't hesitate to get in touch at info@leapsports.org should you need help with planning or have any questions. Written on 8th February 2019.